All types of models are welcome on Cawcutts lake except for those models powered by Internal Combustion engines. Also because we share the lake with anglers, Fast Electric boats are not allowed. At Paxton Lakes only IC engines are not allowed. This still leaves a wide range of models from detailed naval vessels, through lifeboats, tugs and other commercial craft to fun boats like our rowing boat with an authentic action - even if the rower could use a healthier diet! Please see the Photo Gallery for examples of our models. Most of the models, if not sailing vessels, are powered by electricity, but we do have some steam powered models as well. Our agreement for the use of the lake does not allow us to set a course using buoys, so we have no dedicated IOM yachtsmen, but we do have some excellent sailing craft, and IOM yachts are welcome to use the lake but not set a course for racing. We have a small electric launch which can be made available to prospective members, or just to young people who would like to have a go. This is not kept at the lake so a call to a Committee Member is needed to arrange for it to be available. 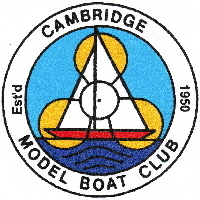 Many of our members have been building and sailing model boats for many years and have built up considerable expertise in all aspect of model boat construction, including radio control and installation of the electrics. All are very happy to share their knowledge with newcomers to the hobby - even if not members yet. We are also able to advise on how to get started in the hobby and occasionally members will have models for sale.